You’ve heard of the Great Migration across the plains of Africa? Well this is a little closer to home but no less magnificent given the scale of the creatures involved. 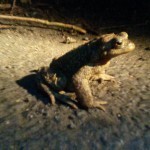 Every year common toads come out from under the rocks, mud and compost heaps where they’ve spent the winter and take the long march to the Ancestral Pond. It might be only up the road or across a couple of fields to you and me but then we’re not 2-3 centimetres high. “Glitch” went the toad, between tarmac and tyre. If only someone had a big plastic bucket. 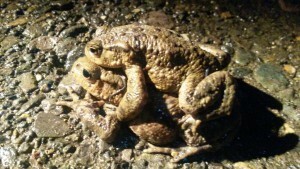 Thanks to the less than wintry weather here, the toads started moving very early this spring. January. We saw the first squashed one in January. As these animals are declining in numbers, our crack team of patrollers have been out every night to lift them to safety on the pond side of the road. 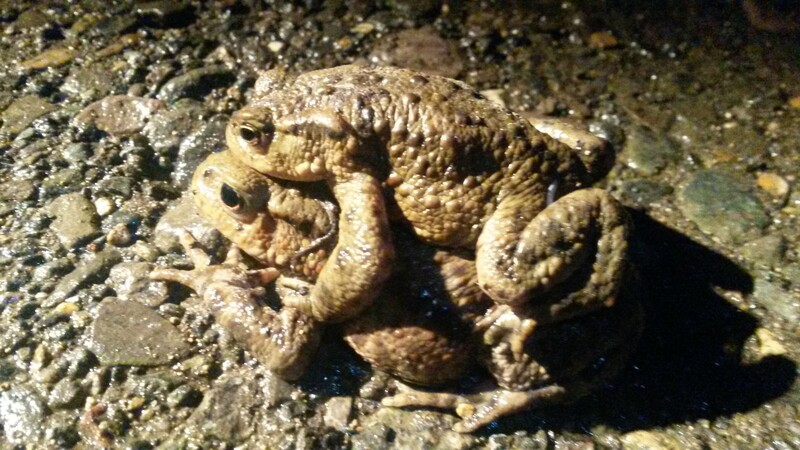 Some nights are just too cold and only the hardiest, lustiest toads make a move. 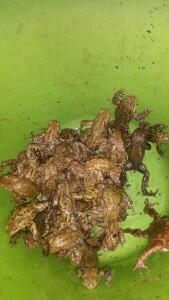 But other nights when the conditions are just right, warm and damp, we’ve been collecting them by the bucketful. 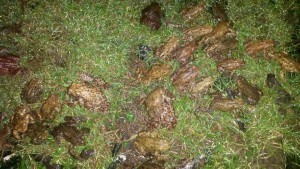 Ever wondered what 40 toads looks like? The collective noun is a ‘knot’. 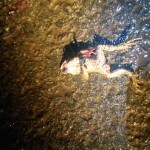 And just so’s you know: they don’t croak – frogs croak. Well, if your instincts promised a pond full of passion, wouldn’t you? Me! I had a brilliant evening at the Sandford St Martin 2015 Awards last night. OK so I didn’t win an award, but then I wasn’t up for one: I was a juror. But I came away from Lambeth Palace feeling like a winner. The evening had celebrated some of the best, most thought provoking, meaningful and, in some cases, uplifting media content of the past year: radio and TV documentaries, sit coms, murder mysteries, period dramas, bio-pics and everything in between. Some of the programmes had flown under the mainstream radar – the winner of the children’s award for example (Fettle Animation’s ‘Children of the Holocaust’ BBC 2) had first been broadcast at 4 in the morning as a teaching aid for schools! – so there were loads of titles that I came home wanting to seek out, others that I wanted to watch again. The best thing though was being in the presence of some quite outstandingly wonderful people. Award ceremonies are always full of outstanding people, we’re there to celebrate the most talented after all. But this room was full of people who were not only talented and not only nice but really rather wonderful: men and women who clearly care about their work beyond personal ambition. The winners of the Sandford Awards are can be found at http://sandfordawards.org.uk/the-awards/2015-awards/2015-award-winners/ I think you can also view the programmes there. Definitely worth it. I was privileged to meet Trude Silman and her sister who not only survived the Holocaust but went on to achieve so much despite all that had happened to them. I was thrilled to meet the BBC’s chief international correspondent Lyse Doucet and see the compassion she has for the people in the stories she has to cover. I was delighted to be able to thank writer Peter Bowker in person for my favourite film of last year, ‘Marvellous’ and very pleased indeed to have the chance to shake the hand of the man at the heart of the story, Neil Baldwin. And if you’ve seen the film you’ll understand how excited I was to see Neil get the Bishop of Leeds to sign his bible. Like I said, I was in the presence of some quite outstandingly wonderful people.